Properties, uses, and occurrence of the most important ore of iron. Hematite is the most important ore of iron. Although it was once mined at thousands of locations around the world, today almost all of the production comes from a few dozen large deposits where significant equipment investments allow companies to efficiently mine and process the ore. Most ore is now produced in China, Australia, Brazil, India, Russia, Ukraine, South Africa, Canada, Venezuela, and the United States. Hematite's Streak: All specimens of hematite will produce a reddish streak. The streak of a mineral is its color in powdered form when scraped across a streak plate (a small piece of unglazed porcelain used to produce a small amount of mineral powder). Some specimens of hematite will produce a brilliant red streak, others will produce a reddish brown streak. Care is needed when testing a specimen of hematite with a metallic luster. These specimens are often brittle and leave a trail of debris along with the streak. That debris is not a powder - it is a trail of fragments. So, to assess the streak, the loose particles must be gently shaken free from the streak plate or very lightly brushed off. This leaves behind the powder that is embedded within the textured surface of the streak plate. In the photo above, the streak on the left has been cleaned of fragments, and you can see that it is a reddish brown. The streak on the right still has a trail of glittery fragments that must be gently removed for proper evaluation. Specular Hematite: Specular hematite, sometimes called "micaceous hematite," has a metallic luster and appears to be a rock composed of shiny mica flakes. Instead those flakes are hematite. Even though this hematite has a silver color, it still produces a reddish streak - which is a key to hematite's identification. Hardness testing on specular hematite is difficult because the specimens tend to crumble. This specimen is about four inches across (ten centimeters) and was collected near Republic, Michigan. Banded Iron Formation: Close-up of a banded iron formation. In this specimen, bands of hematite (silver) alternate with bands of jasper (red). The rock produced where these formations are mined is often called "taconite." This photo spans an area of rock about one foot (30 centimeters) wide. Photo taken by André Karwath, GNU Free Documentation License. Pure hematite has a composition of about 70% iron and 30% oxygen by weight. Like most natural materials, it is rarely found with that pure composition. This is particularly true of the sedimentary deposits where hematite forms by inorganic or biological precipitation in a body of water. Minor clastic sedimentation can add clay minerals to the iron oxide. Episodic sedimentation can cause the deposit to have alternating bands of iron oxide and shale. Silica in the form of jasper, chert, or chalcedony can be added by chemical, clastic, or biological processes in small amounts or in significant episodes. These layered deposits of hematite and shale or hematite and silica have become known as the "banded iron formations" (see image). Massive Hematite: A specimen of massive hematite about four inches across (ten centimeters) collected near Antwerp, New York. Kidney Ore Hematite: Some hematite precipitates in cavities and has the opportunity to form an unrestricted habit. A habit known as "kidney ore" often develops in cavities and is named for its similar visual appearance to an internal organ. This type of chemically precipitated hematite is often relatively uncontaminated with sedimentary clay or host rock inclusions and has a higher purity. The high purity makes this the hematite of choice for making pigments. This specimen is about four inches across (ten centimeters) and was collected near Cumberland, England. Hematite is found as a primary mineral and as an alteration product in igneous, metamorphic, and sedimentary rocks. It can crystallize during the differentiation of a magma or precipitate from hydrothermal fluids moving through a rock mass. It can also form during contact metamorphism when hot magmas react with adjacent rocks. The most important hematite deposits formed in sedimentary environments. About 2.4 billion years ago, Earth’s oceans were rich in dissolved iron, but very little free oxygen was present in the water. Then a group of cyanobacteria became capable of photosynthesis. The bacteria used sunlight as an energy source to convert carbon dioxide and water into carbohydrates, oxygen, and water. This reaction released the first free oxygen into the ocean environment. The new oxygen immediately combined with the iron to form hematite, which sank to the bottom of the seafloor and became the rock units that we know today as the banded iron formations. Soon, photosynthesis was occurring in many parts of Earth’s oceans, and extensive hematite deposits were accumulating on the seafloor. This deposition continued for hundreds of millions of years - from about 2.4 to 1.8 million years ago. This allowed the formation of iron deposits hundreds to several thousand feet thick that are laterally persistent over hundreds to thousands of square miles. They comprise some of the largest rock formations in Earth’s rock record. Many of the sedimentary iron deposits contain both hematite and magnetite as well as other iron minerals. These are often in intimate association, and the ore is mined, crushed, and processed to recover both minerals. Historically, much of the hematite was not recovered and was sent to tailings piles. More efficient processing today allows more hematite to be recovered from the ore. The tailings can also be reprocessed to recover additional iron and reduce tailings volume. Martian "Blueberries": In 2004, NASA's Mars Exploration Rover Opportunity discovered that soil near its landing site contained millions of tiny spheres that researchers nicknamed "blueberries." Upon analysis, they were determined to be composed of iron oxide, mostly in the form of hematite. The iron content of Martian rocks and soil contribute to its red appearance from Earth and helped it earn the name "The Red Planet." Image by NASA. Taconite Pellets: These taconite pellets consist of finely crushed taconite rock that has been processed to improve the iron content and mixed with a small amount of clay to improve pelletization. This is one of the standard ways of shipping iron ore from a mine to a steel mill. The round particles are about 1/2 inch in diameter (1 1/4 centimeter) and are very easy to handle during shipping and at the mill. Image by Harvey Henkelmann. GNU Free Documentation License. Hematite is the world’s most important ore of iron. Although magnetite contains a higher percentage of iron and is easier to process, hematite is the leading ore because it is more abundant and present in deposits in many parts of the world. Hematite is mined in some of the largest mines in the world. These mines require investments of billions of dollars, and some will remove over 100 million tons of ore per year. These open-pit mines can be hundreds to thousands of feet deep and several miles across by the time they have been worked to completion. Hematite Pigment: Hematite was one of the first pigment minerals used by people. At least 40,000 years ago, people obtained hematite, crushed it into a fine powder, and used it to make paints. Shown above are commercial hematite pigments that are available today. From top left, going clockwise, they are: Blue Ridge Hematite, Blue Ridge Violet Hematite, Venetian Red, and Pozzuoli Red. Since the Renaissance, pigments have often been named after the locations where they were produced. The color variations are a result of the type of hematite used and the impurities, such as clay and other iron oxides, that are commingled with it. Hematite gems: Hematite and taconite are often made into tumbled stones or cut into cabochons and beads. These are popular as inexpensive jewelry items. Tumble-polished hematite is also popular as a "healing stone." Some people believe that carrying it will help relieve certain medical problems. This use has no scientific merit and can actually be harmful because it diverts people who need medical attention from seeing a doctor. The name hematite is from the Greek word "haimatitis" which means "blood-red." That name stems from the color of hematite when it has been crushed to a fine powder. Primitive people discovered that hematite could be crushed and mixed with a liquid for use as a paint or cosmetic. Cave paintings, known as "pictographs," dating back to 40,000 years ago were created with hematite pigments. Hematite continues to be one of the most important pigment minerals. It has been mined at many locations around the world and has been traded extensively as a red pigment. During the Renaissance when many painters began using oils and canvas, hematite was one of the most important pigments. Hematite color was opaque and permanent. It could be mixed with a white pigment to produce a variety of pink colors that were used to paint flesh. Hematite is a minor gem material used to produce cabochons, beads, small sculptures, tumbled stones, and other items. The material used to manufacture these products is a silver-colored hematite with a solid, uniform texture. The bright silver color of hematite and its "weighty feel" make it a very popular tumbled stone. Hematite Novelties: Products called "magnetic hematite" and "iridescent hematite" are often offered for sale in gift, tourist, novelty, and science shops and their websites. Most of the time these materials are not hematite but are man-made materials that do not even have the same chemical composition as hematite. 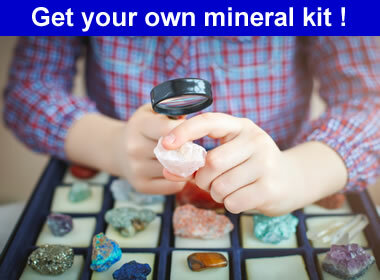 Buy them if you like them but not because you think that you are getting a unique mineral specimen. Some people believe that carrying pieces of tumble-polished hematite, known as "healing stones," will bring relief from certain medical problems. There is no scientific proof that this use of hematite has any positive effect beyond being a placebo. Using hematite as a "healing stone" or a "healing crystal" can actually be harmful because it diverts people from seeing a doctor who can provide proper care. Then when the person with the problem finally decides to see a doctor, their situation is more severe. Hematite can also be ground to a fine powder that when mixed with water will make a liquid with a very high specific gravity. These liquids are used in the "float-sink" processing of coal and other mineral material. The crushed coal, which has a very low specific gravity, is placed on the heavy liquid and the light clean coal floats, while high-specific-gravity impurities such as pyrite sink. Finally, hematite is the material used to make polishing compounds known as "red rouge" and "jeweler's rouge." Red rouge is a hematite powder used to polish brass and other soft metals. It can be added to crushed corn cob media or crushed walnut shell media for tumble-polishing brass shell casings. Jeweler's rouge is a paste used on a soft cloth to polish gold and silver jewelry.